Author Genevieve Cogman tapped into the dreams and desires of just about every bibliophile I know when she created The Invisible Library. There exists a library of all libraries – much like the famed Ancient Library of Alexandria – except that this library exists between dimensions. The librarians here often work as spies and thieves, jumping into different dimensions to collect rare and important works of fiction in order to preserve and study them. We follow Irene, a junior librarian, just as she is returning from an assignment and looking forward to a little down time. But her superiors have another task for her. She is headed to an alternate world London to retrieve a rare book of fairy tales. This mission is a little different, however, as she is paired with a new, young assistant – a young man named Kai. What should have been a fairly routine grab-and-go task, even in a steampunk-like London with supernatural creatures, becomes complicated when the book disappears just before Irene and Kai arrive. Cogman has created the genesis for a series with unlimited potential. This idea of searching for books from a variety of worlds is really exciting, but at the same time, Cogman has her protagonist address a couple of important issues, starting with the idea that this is stealing, even if it is for a ‘good cause.’ And is possessing the books enough? Shouldn’t they be used in some way? While Irene appears to have been born into the job of working for the Invisible Library, she’s always been a bit different from the other librarians – not following the rules explicitly and questioning anything that doesn’t seem right to her. But she’s still a librarian and devoted to the inter-dimensional library and what it consists of. Irene is clearly a character conflicted. This first book in what must be a planned series does a very nice job of setting up the premise, central characters, and general conflict and offers up a pretty simple, sf/f plot. Maybe too simple? I want to say that this plot feels like a YA action story, but I’ve read some pretty intense YA. Let’s just say that the book doesn’t delve too deep. This is about action, with secret agent-like librarians at the center. Does that sound like a fun read? It is. Looking for a good book? 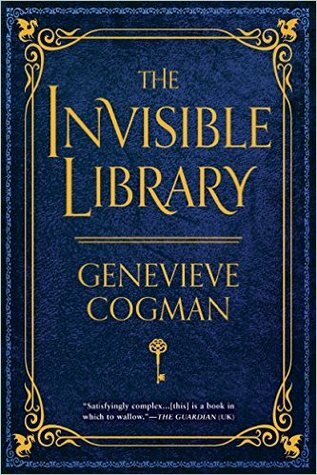 The Invisible Library by Genevieve Cogman is a light but spirited read with room for growth and plenty of stories.